My husband went to the pet store to buy food for the 4-legged denizens of the household and came back with a new toy for one pet and a bell to put on the collar of the other. So, guess which pet is polishing her angel halo this week and which one is, figuratively speaking, in the dog house! I am past the climax of BRANEWORLD now and into the falling action — in spite of the fact that I ignored the draft for several days while revising an older, much-loved manuscript. I can’t wait to type THE END on this troublesome first draft so I can go back and analyze what is wrong with it. Revisions come so much easier to me than first drafts! An opportunity came up to teach an adult class at a local community college, so I decided to give it a try. (Well, I say local, but it’s still a 70 mile round trip.) The course is “Writing for the Children’s Market.” The director has already asked me about other courses in the spring and summer, so this could lead to a semi-regular gig! 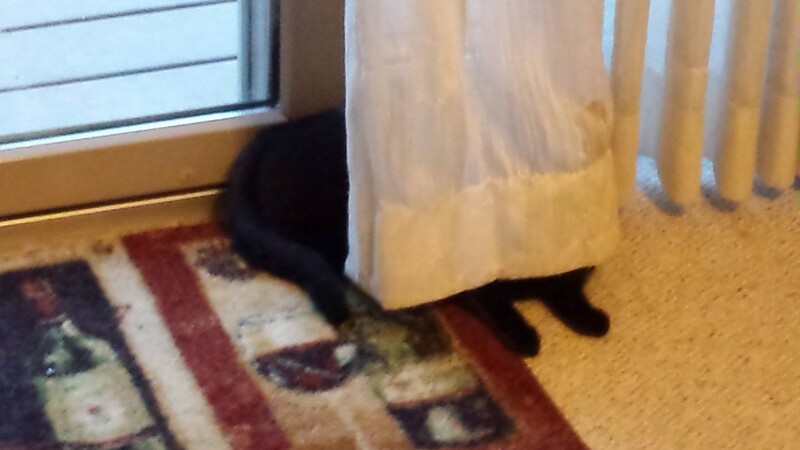 Luna thinks we can’t see her. She is invisible. Or … maybe it’s a better hiding place than I think. Sorcia seems confused. 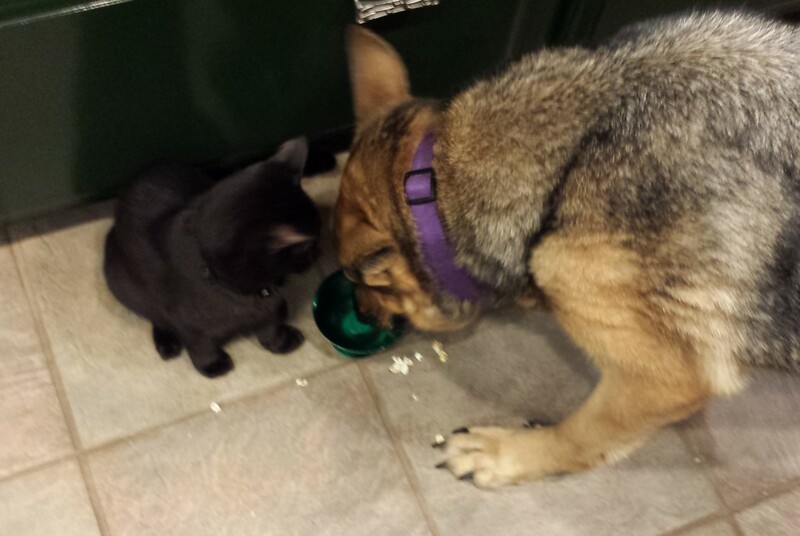 Luna doesn’t want to be left out of Popcorn Night, although she doesn’t get why the dog is so excited about this stuff. Luna isn’t a popcorn cat? I like revisions much better than first drafts as well. Hope you can smooth yours out and fix the issues. Good luck with all of the events! 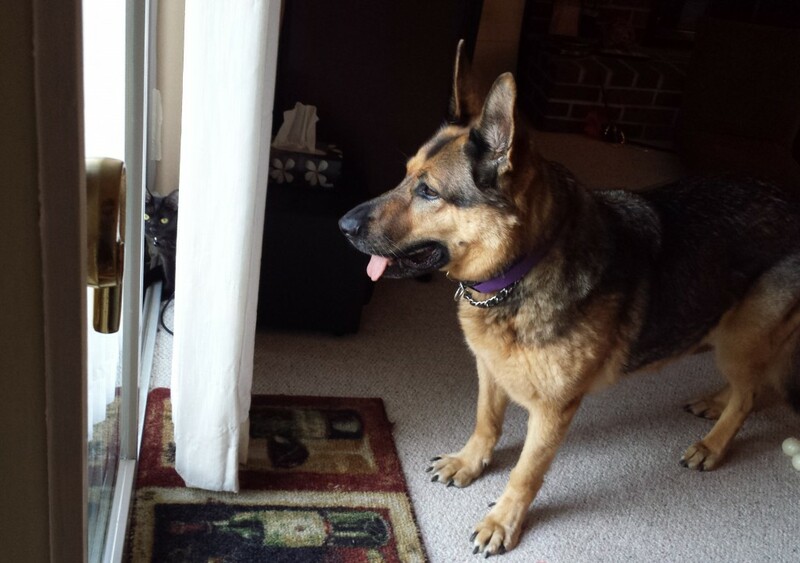 I’m guessing the cat is in the doghouse since German Shepherds are pretty much the perfect dog and almost never get into trouble. Congrats on being that close to typing The End, again. I’m sure it’s awesome. Loved these pics on FB! Good luck with all the book events this week! And yay for being close on that draft! Whew! Lots of travel and busy. I hope you get some writing done around all of that. I dread first drafts too, and editing is TOTALLY easier. I don’t understand these people who fear taking a red pen to their work. It’s so much easier to straighten out a mess when you’ve got all the pieces in front of you. Good luck with your epic-crazy days ahead! I’ll be eating cheese and thinking of you. Unlike you, revisions are the hard part for me. The first draft doesn’t have to make sense to anyone but me, but the revised versions have to make sense to everyone. And that’s where I need the most help. Good luck with your book events. Wow. You are busy! Good luck with the book events and all those miles. I totally hear you on the editing over original draft – always more fun. Glad you’re almost at the end. Is that the string theory story??? Tonja, yes! I call it “The Adjustment Bureau” meets “The Boy Who Reversed Himself” plus a little string theory. I have a lot of online and in-person events this week too. Maybe something is in the air. You have a German shepherd! I love them. I had a German Shepherd—she passed last January. Now I have a German Shepherd/Greyhound mix. Sounds like you’ll be busy with author stuff. How fun! 600 miles. That’s a bit of a drive. How fun to teach adult classes~you think you’re out but they pull you back in. Luna is a good hider! You’ve been so busy since you retired, I’ll bet you haven’t even had a chance to miss “working.” I know a part of you loved teaching, but I have a feeling ALL of you enjoys what’s been happening with your writing career.